Hi guys! Long time, no blog. Guess who has jet lag? San Francisco was nice...at least as much as I got to see of it. They say you need 24 hours per time zone change to readjust and I'm right in the middle of it. 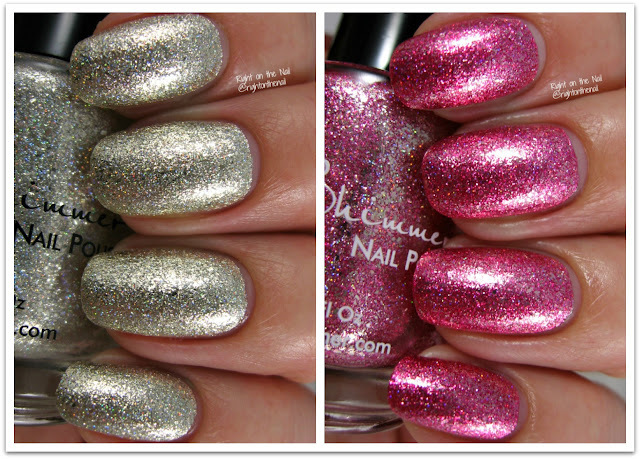 Tonight I have another exclusive polish from Polish Pickup which I mentioned a couple weeks ago. If you need a little refresher on how it works, follow the link here for more information. Northern Star Polish is run by Kristen and she's been making polish for years. Last year she took a long hiatus and this is her way of getting back into the polish game. She made some of my favorite cuticle oils, but it doesn't look like she's making those yet. On the bright side, Northern Star Polish is releasing another polish for September's Polish Pickup and you can see that here. I know, I know, Shark Bite isn't for sale anymore, but at least you can see a pretty swatch and learn a bit more for the pre-order which goes from 9/1-9/4. It's a teal blue cream base with fuchsia microglitter and aqua blue shimmer. It's extremely saturated, but I didn't have any issues with staining. That said, this is the type of color that may stain so don't forget your base coat! The formula was just perfect, and I needed just 2 coats for full coverage. Even with the microglitter, it does not dry textured so you can use pretty much any top coat you have around. This is supposed to be named after a drink, but I've never heard of a Shark Bite. Please tell me I'm not the only one! Obviously this has everything I love in a polish. Saturated color? Check. Contrasting shimmer/microglitter? Check. Good formula? Check. I'll definitely be purchasing a few polishes from this month's Polish Pickup and there's a good chance I'll get Take a Bite from Northern Star Polish. Again, you can learn more about the Polish Pickup on their Facebook page and website and the pre-order begins on 9/1 with flat-rate shipping of just $3. I don't have any of these to show you, but check out xoxoJen because she has links to all of her swatches. Stick around to the end of the post for more restock information. Hi guys! This post was supposed to go up yesterday, but it was just taking me too long to get all of the photos edited in time. In other news, did you watch the eclipse? We had about 93% occulsion of the sun here and we were lucky that it was really clear at work. People were camping next door to get a good look and we had several glasses to pass around. 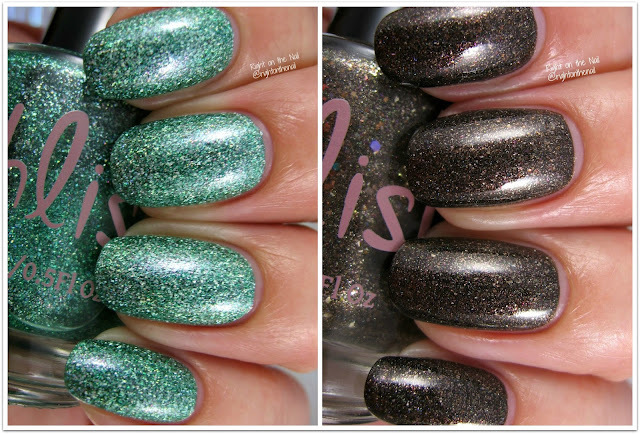 Anyway, tonight I have the brand new Quixotic Polish collection that features contrasting shimmers. 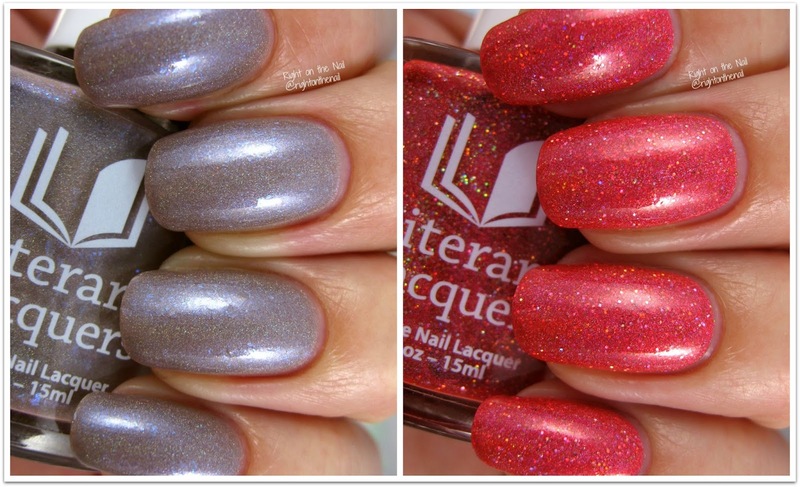 I've been waiting for an indie to do a whole collection of shimmers like this, so I was ecstatic that Mary from Quixotic was the one to release it. These were released on Sunday, so you can find them in the BigCartel site right now for $10 each or $47 for the whole set. Let's take a better look at these warlocks. Hi guys! I'm still recuperating from my long weekend. My brother is coming into town this weekend, but I think it's supposed to rain. Boo. A few weeks ago KBShimmer had a sale and I just had to buy some polishes. What really caught my eye was the Birthstone Collection. I know it was released last year, but these holo metallic colors were too gorgeous to pass up. Each month's birthstone color is featured and you know I had to buy mine. Shall we get to it? Hi guys! I was in DC for a pen show all weekend and I was just too exhausted to blog last night. Tonight I have a polish that was exclusive to the Indie Shop: Atlanta back in March. I've been going through these slowly because they're no longer available anyway. Bliss Polish is a brand I've been meaning to try out for years, so I was ecstatic that Yvette was in Atlanta to see them in person. The label reminds me a little of what Cirque used to have before the rebranding this year. Secret Grove was a part of trio that was available, but I was only able to snag this one. Secret Grove is a blackened teal crelly with blue, green, and gold ultrachrome flakes. I found that it had the perfect amount of flakes without making it apply too thick. You could easily get away with 2 smooth coats for full opacity, but I went a third just to add a little more dimension. I just love this one! Unfortunately this one is no longer for sale. Bliss Polish currently has a bunch of creme polishes on clearance for only $6 and I have my eye on them. Make sure to check out Bliss Polish on their Facebook and Instagram pages for more information. Hi guys! TGIF! 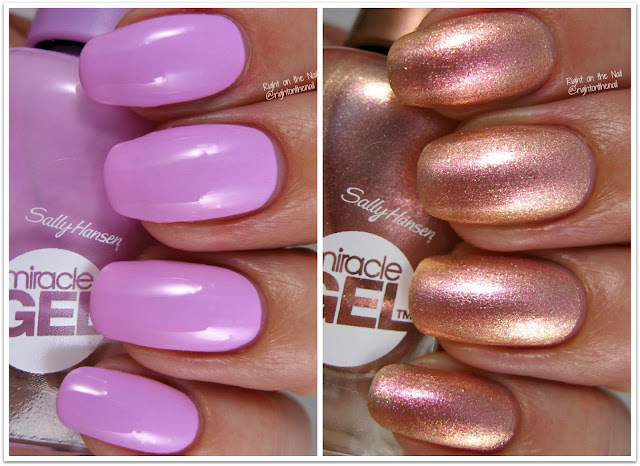 Tonight I have 2 polishes from the second upcoming Sally Hansen Collection called Romantic Rendezvous. These collections were inspired by the travels and adventures of Sally Hansen Global Color Ambassador, Madeline Poole. Wouldn't that be an amazing job? Where do I sign up? This collection also features 7 polishes, so you have a total of 14 new ones to choose from. Shall we get started?